Not many people would choose to be in a wheelchair; however, no other medical device can offer more mobility and independence. Whether someone from Ravenna, Ohio, has become suddenly disabled or a resident of Uniontown, Ohio, has experienced debilitating health issues as they have aged, Access Solutions, Inc. provides a plethora of solutions that can help people who need to get around more efficiently while they are in a wheelchair. Not only does this local home mobility company help people age in place with affordable wheelchair lifts, but also with stairlift installation, residential elevators, dumbwaiters, and modular, portable, and threshold access ramps. People from Bath, Ohio, to Mentor, Ohio, will find the unexpected benefit of also increasing the value of their home while trusting Access Solutions, Inc. to help them create a barrier-free living environment. Spring has arrived, and the temperatures are gradually increasing, motivating people to enjoy the beauty of the outdoors more frequently. Access Solutions, Inc. can help anyone from Bath to Uniontown get around more effectively in a wheelchair with their wheelchair lifts and access ramps, whether they need to bypass several stairs at the entrance to their home or accommodate a step down from a patio. This local family and veteran-owned home mobility company strives to make each client’s day-to-day life much easier with their options in barrier-free living. 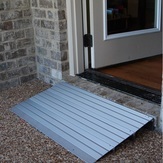 Access ramps are generally low to no maintenance and can blend into a home’s surroundings when properly constructed. Modular access ramps don’t require permanent structural alterations so are perfect for installation at rental properties or where long-term use in not warranted. They are typically pre-fabricated and installed on-site. 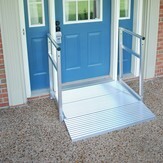 Another form of temporary access ramp is a portable ramp. They are typically used for a lower rise height of up to eight inches, allowing any caretaker the ability to set it down and remove it after each use. It boasts a variety of fixed and folded styles to accommodate different situations. Wheelchair users from Mentor to Ravenna can also gain their freedom when going from room to room of their house with threshold ramps. No section of one’s home is off-limits with these durable ramps that are perfect for navigating through raised doorways or over any obstacle present in a home. Not only will the durable ramps that are installed by Access Solutions, Inc. give anyone with physical disabilities the ability to regain their freedom so that they can age in place, but their mobility modifications will also increase the value of a home. They excel at all products that increase one’s day-to-day functioning — including affordable stairlift, dumbwaiter, and elevator installation, that will ensure anyone’s environment is as convenient and safe as possible. 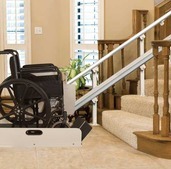 Whether someone in Mentor, Ohio, is looking for a portable access ramp to make transporting their mother an easier process or another person in Ravenna, Ohio, wants to age in place, Access Solutions, Inc. offers a vast array of solutions for barrier-free living — including affordable stairlift, wheelchair lift, and access ramp installation — customized to each circumstance. This local home mobility company can not only increase the value of anyone’s home from Uniontown, Ohio, to Bath, Ohio, but also can make getting around in a wheelchair more efficient with their modular, portable, and threshold ramps. Regardless if someone is looking to age in place or make their everyday life more independent, they can count on the compassionate services from Access Solutions, Inc. This entry was posted in Handicap Modifications, Home Improvement and tagged access ramps Ravenna Uniontown Bath Mentor Ohio, Access Solutions Inc, affordable stairlift installation Ravenna Uniontown Bath Mentor Ohio, age in place Ravenna Uniontown Bath Mentor Ohio, barrier-free living Ravenna Uniontown Bath Mentor Ohio, getting around in a wheelchair Ravenna Uniontown Bath Mentor Ohio, increase value of home Ravenna Uniontown Bath Mentor Ohio, local home mobility company Ravenna Uniontown Bath Mentor Ohio, modular ramps Ravenna Uniontown Bath Mentor Ohio, portable ramps Ravenna Uniontown Bath Mentor Ohio, threshold ramps Ravenna Uniontown Bath Mentor Ohio, wheelchair lifts Ravenna Uniontown Bath Mentor Ohio by admin. Bookmark the permalink.